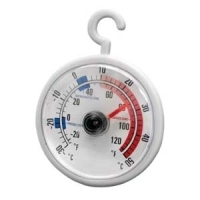 This Bimetal Refrigerator/Freezer Thermometer accurately displays the operating temperature of your fridge or freezer in both Fahrenheit and Celsius. If your refrigerator is too cold it can waste electricity and money, and settings too warm can spoil food and subject you to food borne illnesses. The card features a hanging tab and magnetic strip for those who desire to permanently affix it to the appliance's inside wall. By operating your refrigerator or freezer to recommended settings, you can save energy and improve efficiency by up to 8%.